“[It’s] one of the greatest unexpected blessings in my life,” says A Ray of his sponsorship by Dynamic Discs. One of the original team members back from 2013, this Texas native is always seen with a big smile on his face and a feeling of gratitude in his heart. Active in his local disc golf scene as well as making appearances as larger scale events, A Ray is a true ambassador not only for DD but for the sport as a whole. With 22 career wins under his belt, you would think this 940-rated player is constantly on the course working on his game. While A Ray does certainly get his disc time, he’s also a devoted man in other areas of his life. When not on the course, he spends time with his wife, grandkids, and loves to play board games. 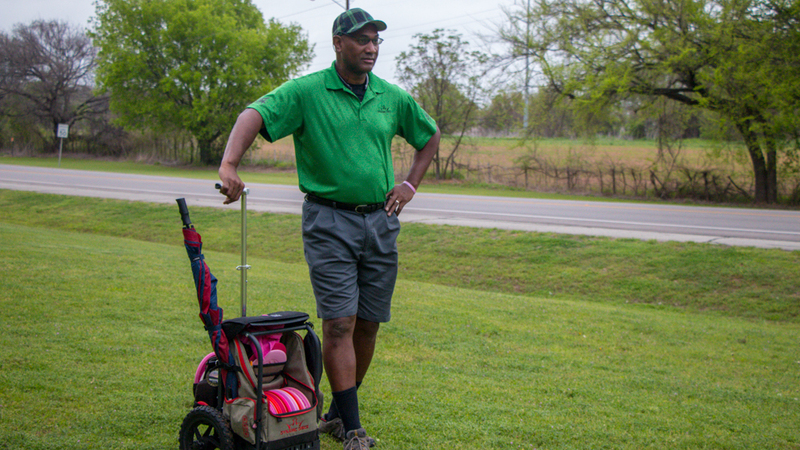 After retiring from a career in public education that spanned 30 years, he recently took a position as a traveling HR professional, giving him the flexibility he needs to keep his disc golf skills sharp. Not only does A Ray have specific discs he favors, but there are events each year that really catch his eye. He was very excited about this year’s Am Worlds and had the goal of placing within the top 10 in his division. The Amateur Masters 50+ competitors put up a good fight, and while he didn’t reach his ultimate goal, A Ray still had a great performance, tying for 22nd out of 108 in his field. He also raves about the Piney Woods Open in Tyler, Texas, saying that event boasts the three best courses in the entire state! This A-tier set in October features tons of local talent spread across more than a dozen divisions. “My biggest accomplishment this year is increasing the reach of the people who are taking disc golf lessons locally,” says A Ray when asked about his 2018 season thus far. Not only does he focus on the sport at a grassroots level, but as a DD team member, he understands the value he brings to disc golf on a larger scale. Learning a lot from World Champions and top professionals, he knows that he’s with good company: “The DD team is a true family looking out for one another.” We love having A Ray as a part of the Dynamic Discs team and wish him luck during the rest of the season! I met A Ray in 2014 at Texas States in Round Rock. I tend to give him a hard time, but nonetheless, even though we’re in the same division, his willingness to continue to give me tips over the years is commendable. His dedication to development of the sport and players is awesome. He’s a true Ambassador to the sport. Forget disc golf - this guy inspires future teachers. He willingly comes to my class of undergraduates to help them succeed in their future career.